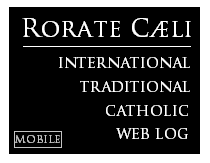 RORATE CÆLI: Pope Francis: Triumphalist Christians "do not believe in the Risen Lord"
Pope Francis: Triumphalist Christians "do not believe in the Risen Lord"
(Vatican Radio) Christians are called to proclaim Jesus without fear , without shame and without triumphalism . Those were the words of Pope Francis at Mass this Tuesday morning at the Casa Santa Marta. The Pope also stressed the risk of becoming a Christian without the Resurrection and reiterated that Christ is always at the center of our life and hope. Lydia O’Kane reports. "But, the Holy Father continued, it is not always easy to understand . The Pope then recalled that when St. Paul spoke to the Greeks in Athens he was listened to with interest up to when he spoke of the resurrection. "This makes us afraid , it best to leave it as is." Pope Francis said. Finally, said Pope Francis there is the group of Christians who "in their hearts do not believe in the Risen Lord and want to make theirs a more majestic resurrection than that of the real one . These, he said are the “triumphalist” Christians. When we look at these Christians , with their many triumphalist attitudes , in their lives, in their speeches and in their pastoral theology, liturgy, so many things, it is because they do not believe deep down in the Risen One. He is the Winner, the Risen One. He won. Later that morning the Pope met with 30 heads of the Curial dicasteries, "in order to listen to the considerations and advice offered by the highest-ranking figures in the Roman Curia and the Pope's main collaborators in Rome ... within the context of the implementation of suggestions presented by the cardinals to the congregations in preparation for the Conclave and the Holy Father's reflections on the government of the Church." 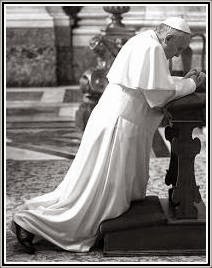 Rorate note: It is true that this is not the first time that the Pope has criticized "triumphalism" -- see his homilies for April 12 and May 29. In today's homily the Pope has gone further than the generalities of his previous remarks to assert the existence of this triumphalism in some Christians' "pastoral theology" and "liturgy". Are you fully back to the 1970s yet? I, for one, will remain one of those "triumphalist" Christians attached to the ancient Roman rite. Would somebody explain what the Holy Father is saying. I had trouble following. I'm a little confused by the term "triumphalism." Can anyone offer a little clarity on this? Thanks. Triumphalist liturgies? To which liturgies could he possibly be referring? I wouldn't read too much into the HF sermons. He is just out there trying to "make a mess". "Don't believe deep down in the Risen One?" Gosh! He's not possibly talking about these folks, is he?! I have no idea what the Pope's statements are supposed to mean. Is this because I have an inferiority complex? And that is why I like the Latin Mass? And so the cure for my complex would be to get rid of the crucifix in my office, and replace it with a multi-colored walking stick with some fish on it, and a poorly drawn caricature of a heart in the middle? Is this so Muslims won't be offended by the reality of the Crucifixion? Why do I have the feeling that the Holy Father's words, translated into English, remain in a foreign language? Count me among those confused as to what or who is "triumphalism" is. From the article, a triumphalist apparently does NOT believe that Christ triumphed over sin and death??? That's an odd name to give such a belief - a name that indicates what it does NOT hold? Whatever it is, I can't imagine that denial of the Resurrection is a major problem in Catholic theology. Still, I can't help thinking that the intended target is traditionalists/traditionalism eventhough it's as far off that mark as the previous "Pelagianism" accusation. On another site I frequent, I saw someone provide this text below which they attributed to Fr. James Martin, SJ. Agree with it or not, this Jesuit's take (Fr. Martin) may be indicative of the Jesuit take on Triumphalism as seen by the HF? What does the Pope mean by triumphalism? Many people have asked some questions on this page this morning about triumphalism in the church, and what the Pope meant in his homily this morning. Specifically: What is "triumphalism"? Triumphalism is usually (in Catholic circles) taken to mean a particular approach to our understanding of the Catholic church. Rather than focusing on the "triumph" of the Resurrection, we instead focus on our own "triumph," as in: "We Catholics are perfect. We are always right. We have all the answers. Everyone else is wrong, and they have nothing to offer us whatsoever, and we're going to let them know it--often." Basically, it is a focus on how great we are. In other words, triumphing in ourselves rather than in the Risen Christ. It also implies assuming, seeking and enjoying a position of power, dominance and even ruthlessness, as well as forgetting the need to be humble, gentle, charitable and--as Jesus asked--a servant rather than a master. Triumphalism, again in Catholic circles, is usually taken to mean the opposite of humility in the presentation of our message--which is, paradoxically, about triumph, i.e., Jesus's. It is related to the sin of pride. If you think about the disciples and how they expected the Messiah to behave (in earthly triumph) and how Jesus did behave (in triumph through humility and obedience to the Father) you have an idea of the dichotomy between triumphalism and humility. It took the disciples a while to get this. To paraphrase Paul, if we boast at all, we should boast in, or about Christ, not in ourselves. At least that's how I see it. For a better understanding of what the Pope means by this, just look at what he does and the choices he makes, which are all about humility. As with Jesus, his words give meaning to his actions and his actions to his words. I'm 24 four years old and I have never imagined that we would have a brand new Paul VI governing the Church again. Pope Francis is a mix of three Popes: John XXIII, Paul VI and John Paul II. After the abdication of Benedict XVI we all knew that something really bad could happen in the papacy. But let's pray to Our Lady that she may have mercy on us. Since it is difficult, if not impossible, to understand to whom Pope Francis is referring, perhaps we should all just put his words serenely out of our minds, until he says precisely who and what he means. I'm still waiting for The rapture. It is because of the lord's resurrection, his triumph over death, that I am a triumphalist christian. Why would you be any other kind of christian? Okay, maybe he is talking about those who do not believe in the Resurrection but say it is some spiritual or symbolic thing? I have run into these "Catholics" before. Alexander, I too have run into such catholics, but mostly on websites like that of the National Catholic Reporter. So if that is what Francis means, how come all these NCR types loves Francis? I'll still be counting my Rosaries since I'm a Pelagian and I'll still continue attending my triumphalist Traditional Latin Mass, the Mass Pope Francis attended even as a Jesuit novice in the late 1950s and early 60s and now obviously despises. I also will be making no contribution to Peter's Pence in the foreseeable future. Or maybe the HF is "speaking in tongues"? My guess is that comments like that from the Holy Father are driven by his experience in Argentina and the resulting, it is whispered, Peronist sympathies he developed. I am reading, in a somewhat desultory manner, as is my custom, Crassweller's "Peron and the Enigmas of Argentina," and Crassweller points out that Peron saw the real impoverishment of the lower classes, to such an extent that one third or more of recruits to the army were turned away for physical weakness due to undernourishment. From this, and even before the advent of Evita, Peron adopted what Crassweller says was for the first time in Argentine politics, the notion that the people had to have a real vote in presidential elections and the like (before that the political class evidently controlled everything either through coups or manipulated votes), such that he himself said he would never take power except if duly elected (as happened). And of course, Peron advocated government for the benefit of all the people (apparently a somewhat novel idea there at the time in the mid 1940s), and so was the great installer of social programs [not saying I approve, just that was the history]. It seems that with the drive to improve the lot of the materially disadvantaged, it was (and is) all too easy to glorify the lower class itself and make it the principal area of one's interest and concern. So instead of exalting the wealthy, or the cultured class, there was the exaltation of the workers and peasants/gauchos. How easy would it be for a young, not so well off, man like Jorge Mario Bergoglio, to absorb this spirit as much by osmosis as by conscious thought. So maybe in the back of his mind, he sees Tradition as an expression of the despised upper class, and so he would not be at all interested in advancing Tradition, and might well end up by trying to suppress it. And likely not just Tradition, as in the 1962 Missal and pre-Vatican II books and sermons and thought based thereon (e.g. the "manuals" so disliked by the Conciliar radicals), but also even "conservatives", such as the FFI, the IVE and maybe even Opus Dei, if they don't keep their heads down. Too much appeal to the educated classes, after all. Open season on Traditional Catholics. We do not believe in the Resurrection. This is much, much, much worse than anything I could have believed possible. We are explicitly on notice. The Pope has commenced to come after us. Catholics, by their very nature as part of the mystical Body of Christ are TRIUMPHANT, because Christ was slain for our sins and TRIUMPHANTLY Resurrected Himself. Catholics cannot but exist as Triumphant graftings onto Christ. Humility, is at its very core, is acknowledgement of the truth. And being Triumphant in Christ is Truth Himself! I am a triumphalist Christian, thank you, and a Triumphalist Catholic, thank you, and I believe every bit as much in the primacy of Jesus Christ as the current occupant of the Domus Sanctae Martae. My faith is one and the same as the one that triumphed at Lepanto over forces of great EVIL. He should look to his own house - his own ORDER, in fact - and clean it up before criticizing the faiths of other Catholics. This "pope" leaves simultaneously hot and cold: hot under the color and stone cold-shouldered by someone who should know better in his "pastoral concern." I’m just an ordinary Catholic, although one who has never changed their Faith one whit since having been taught it by holy nuns and then Salesians from the Penny Catechism and I eschew labels, yet I confess to more and more confusion with some of the Holy Father’s pronouncements. Are they each meant to be a sort of Motu Proprio ? Or are they simply pious ejaculations and not binding ? It’s baffling to me and I seem not to be alone in this. I don't believe HH is referring to traditionalists here. Don't you know he already has named us 'pelagians'? I suppose the bright side is that he is 76 and not 56. And if Francis does decide to mess with the Fraternity of St. Peter, the Society of St. Pius X will be there. It was a favorite term of opprobrium used by the post-Vatican II generation of modernists in the 60s and 70s. I know, because I had it slung at me many times during those years. A "triumphalist" adhered to traditional theology, liturgical practices, regarded the Catholic Church as the one true Church, and generally, was mired in the "old Church" mentality which the Council and its spirit, thank God, had finally surpassed. Triumphalists were considered psychologically damaged, rigid, clericalist, exclusivist, and anti-pastoral; they "put God in a box." Since he is very much a child of the 60s generation, I have no doubt whatsoever that this is the sense in which Francis employs the term. It's his way of saying that not only is the cafeteria officially open once again, but also that trad and neo-con dishes will no longer be on offer. The bottom line is that henceforth when it comes to the "spirit" of Vatican II, Borg, resistance is futile. There is a marked difference between a triumphant Christian and a triumphalist one. The former knows Christ has defeated death and forgives sin, while the triumphalist one claims everyone is saved regardless and that liberal modernism discovered the true faith after 1965 years of empty rhetoric & theological darkness. Obey God, not man as St Peter warned us. St Paul told us to live out the faith handed down to us from the Apostles, while Our Blessed Lord encouraged us to beware of whited-sepulchres and wolves in sheep's clothing as he upbraided those who turned His father's house of prayer into a market-place. Witness 44 years of liturgical abuse, not to mention the illicit liturgical experiments for several years prior to 1969. Have we not choked enough on papal liturgies that set the tone for the liberals to follow: dancing, rock music, profane instruments, ignored or modified forms, appalling distribution of Communion and so forth? After 48 years of liberal modernist misdirection and destruction "razing bastions" I have become used to The Vatican misrepresenting The Roman Catholic Faith in a pot-pourri of postmodernist verbiage. I no longer care what Rome utters anymore since I know Christ liveth and that he will recognise those who have been lovingly faithful through obedience to His commandments. Pope Gregory The Great, Pope St Pius V, Pope Pius IX, Pope Leo XIII & Pope St Pius X, among the many other Holy Fathers, have given us enough liturgical & doctrinal sustenance to be assured that anyone who tries to abrogate The Latin Mass, guaranteed to Roman Catholic priests and lay "in perpetuum", by using vernacular or by changing its form, is anathema. The Latin Mass reenacts in an unbloodied manner Our Lord Jesus Christ's Calvary. If Rome dislikes that it has to abolish more than 1,500 years of magesterial and pastoral instructions. Let them dare! My undestanding is that the concept of "triumphalism" has been used ideologically to attack from within the Church, especially after Vatican II, but that it has been also used in another sense (or a corrected sense, as the Church often has done with concepts invented by heretics) to criticize precisely those Catholics who, instead of trusting the Church and God's grace, trust their own creativity and human means. I am not sure, but I think that Ratzinger use the right concept even to point to some progresists in liturgical matters. Of couse, someone who celebrates the liturgy exactly as the Church commands, cannot by definition be a "triumphalist" in the negative sense, for he is obeying the Church and trusting only in God's supernatural power. The Pope, in his interview coming back from Brasil, if I do not remember bad, praised Orthodox liturgy, which is full of majesty, perhaps in some respects even more than the Latin liturgy in its most solemn form. So the Pope cannot be referring to those who rever the traditional liturgy, for that would be contrary to the Magisterium of the previous Pope in Summorum Pontificum: what was worthy of reverence yesterday, so it is today. Is it time for traditionalists to create a "holy lio" as Francis requested in Brazil? "Many people have asked some questions on this page this morning about triumphalism in the church, and what the Pope meant in his homily this morning. Specifically: What is "triumphalism"? If you think about the disciples and how they expected the Messiah to behave (in earthly triumph) and how Jesus did behave (in triumph through humility and obedience to the Father) you have an idea of the dichotomy between triumphalism and humility. It took the disciples a while to get this. To paraphrase Paul, if we boast at all, we should boast in, or about Christ, not in ourselves." Pope: No to triumphalism in the Church, proclaim Jesus without fear and embarrassment. 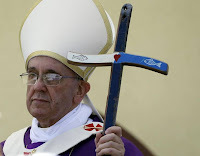 ... in which case it seems ironic that the Pope carries a cross which does not have the figure of Christ on it (i.e. a crucifix). Ben, the crosier sans corpus is the traditional staff of the popes. With every new statement lashing out at restorationists, Pelagians, triumphalists, et al, the hope that Pope Francis is thinking about anyone other than traditional Catholics becomes ever more desperate. Wow. Not only are these astonishingly sharp condemnations, but (if true) they would be legitimate causes for the strongest kinds of ecclesiastical censure and discipline. I have the sinking feeling that he is preparing us for some rather sweeping decisions. Since it is difficult, if not impossible, to understand to whom Pope Francis is referring, perhaps we should all just put his words serenely out of our minds, until he says precisely who and what he means." I think that's where I'm at at this point. It's all too opaque to decipher. I absolutely believe that these past few decades of darkness WITHIN the Church institutions in an unfolding of God's will. I believe that just as Christ had to enter a period of scourging and humiliation. The church institutions will also be scourged and abused and degraded before the world. All it's earthly power we will be of not value or use. I pray for God's will to be done with and to the Church ...observing from the road just as Simon of Cyrene. when called to carry my share of the cross ... I will. I wouldn't be too sensitive to these remarks, nor would I ignore them. There are so many things I'd like to say, but I'll try to keep my remarks relatively brief. For the better part of 35 years, JPII and B16 essentially operated on the belief there were only friends to the right of them. JPII opened the door to the TLM while B16 gave us SP and an attempt to bring back the SSPX to the fold. Now, we find ourselves in a situation where the current "Bishop of Rome" seems to believe only enemies are to the right of him. He's called us pelegians and now triumphalists. What's next? Despite this, Francis is a hit with everyone. The liberals love him, even though they still don't attend Mass, and the casual observer finds great hope in a man who rides around in a ten year old Ford Focus and talks non-stop about the poor. I fear what 10 or even 15 years of Francis as Pope might produce. My guess is we'll have essentially become the Lutheran Church on steroids and, while the masses love Bergoglio the man, it remains to be seen if he'll have any effect on the empty pews, seminaries, and convents. I fear, rather than bringing the Church together, he may only make the divide greater. He's certainly done much to make the SSPX look very attractive. Seriously. Reading IS fundamental. I don't see how any traditionalist could think Francis was leveling these charges at them. While I understand how some would misconstrue the Holy Father's words, I also argue that he is not referring to traditionalist Catholics. In the context provided it seems like he is chiding the 'ruling class' Catholic. He may also be referring to those who turn a blind eye to trouble in the Church all the while pointing to Christ's triumph which the Pope suggest they don't actually even believe. I find it much more gratifying to put his words right back on the liberal/modernists & 'church of nice' types. Of course, no one knows what is in His Holiness's head until and unless he elaborates further, either by word or deed, such as at the upcoming meeting with the cardinals. I do not think Fr. Martin's explanation is likely to explain what Pope Francis meant. If I were to bet, I would place my money on Fr. Cekada's explanation. My experience of the way in which the word "triumphalist" was (and is?) used is the same as his. I also do not think that praise for the Orthodox Divine Liturgy indicates that HH appreciates traditional liturgy. Do not forget that in the N. O. liturgy that is the "Work of Human Hands", one sees all too often the faux processions of the Gospel in very bad imitation of the Great Entrance in the Divine Liturgy. One well-meaning lady I know even does a kind of version of that procession every time she brings the Gospel book out of the Opus Dei-served chapel where I attend the N.O. on weekdays, after Mass, to place it back on its stand in the narthex. I have heard Orthodox priests simply laugh at the thought that Eucharistic Prayer Four is (supposedly) of a piece with the Divine Liturgy eucharistic prayer; and having experienced both liturgies regularly (in the Ortho case, some years ago), I can guarantee you that EP4 is no way like or as long as, the DL prayer. So what the Gospel procession and EP4 really look like to the Orthodox mentality is the dumb Latins (a term of opprobrium applied to all us Romans) trying to mimic the Divine Liturgy, and looking like monkeys in the process. Has it occurred to anyone that perhaps the Holy Father is referring to those who do manipulate the liturgy for their own agendas as being triumphalist. In my cura animarum and dealings with some of my brother priests entrenched in unbridled liturgical creativity that is the attitude I have generally observed. The liturgical shenanigans of the last half century has been an expression of triumphalism in the worst sense of the term, an arrogance which says, "we know better than the Church......we are the enlightened ones in these latter times, unlike the past generations of the last two milennia". In stripping the liturgy of all theological significance and reducing it to a banal celebration of man we are left with a parody. One will discover that a lack of belief or at the least a weak belief in the real physical resurrection of our Lord often accompanies those who advocate liturgical abuse. These wild inferences of applying the words of the Pope to people who attend the traditional Mass seem to only feed the prejudiced fear some have concerning this Pope. One should not audaciously read into what the Pope says if he has given no clear indication who he is referring to. Now some may say how can I say that he is referring to those who abuse the liturgy, correct, so until we know exactly, let's not run wild but calm down, this euphoric fear, at times lack of respect for the office and person of the Holy Father is a cause of scandal. I didn't manage to get in my earlier comment that according to Merriam-Webster the term "triumphalism" was first used in 1964. “Jesus is the Winner who has won over sin and death.” Sounds a bit triumphalist to me! Really? ironically remarks: ' I can't believe all those Cardinals, inspired by the Holy Spirit, elected Francis." I am interested in this idea that the Cardinals are inspired by the Holy Spirit in electing the Pope; I would like to know where it originated. It is of course totally baseless - the Holy Spirit provides the cardinals with the graces to accomplish their duties of state in electing the Pope, but they are free to cooperate with these graces or reject them, as is evident from many papal elections; in no way does the Holy Spirit 'inspire' the cardinals in their choice of Pope. But the idea that this inspiration occurs is so common that it must have been promoted as true at some time. I for one am tired of the way Pope Francis confuses us. We get translations, since he doesn't speak English (apparently) which may not be true to what he means. Very frustrating. The Catholic Faith is superior to all others. I do not believe the Holy Father Questions that. Its precisely because Christ won over death that we should be converted to humility the virtue opposite to pride. The Holy Father is talking to our interior attitudes. Listen to yourselves people, This is the Vicar of Christ and you speak of him this way? He has done nothing to harm any traditionalist, and if calls you to humility, you should be open to that calling, to even eat humble pie if you must! It would be nice if we could expect to understand what the Pope is saying, or who he is describing. But I guess it would also be unrealistic. More words and communication than ever, all more unclear and ambiguous than ever. For all the talk about the Truth being a Person, it seems like the Truth is more of a linguistic construct. I think (with the appropriate adaptation to our situation) the Russians have the best approach: "God is high above, and the Pope is far away." That is going to be my philosophy from now on. "Wisdom shall praise her own self, and shall be honoured in God, and shall glory in the midst of her people, and shall open her mouth in the churches of the most High, and shall glorify herself in the sight of His power, and in the midst of her own people she shall be exalted, and shall be admired in the holy assembly." (Ecclesiasticus 24: 1-3). God loves the triumphalism of the Catholic Church of all ages. As Pope Leo XIII said: "Such is the Church's greatness: she conquers when attacked; when beset by snares she triumphs;... she struggles and is not overthrown; she fights and is not overcome." (Exunte Jam Anno). And yes, the Catholic Church alone has all the truth, and outside of her there is no salvation. That's what the Church has always taught! I thought I knew what Pelagianism was until Pope Francis used the term. I thought I knew what triumphalism was until Pope Francis used the term. I can only conclude that a lot of important stuff is being missed and left out in the editing and reporting of these homilies which would give the context required to elucidate their meaning. As it is, everyone is running around like headless chickens wondering if he is pointing his finger at them each time he lets loose with one of his judgmental swipes. Alternatively, as he appears to preach ad libitum, he might have just lost the thread of what he was saying and came out with a load of crap instead. What I heard His Holiness say is what the liberals have been saying for decades, that Christ didn't really rise from the dead and that the Mother Earth and all of the other crap that LCRW and others espouse is really who he is referring to and calling them triumphalistic. Anyone else get that impression? http://www.answers.com/topic/triumphalism#ixzz2eXfP6ooc: The attitude or belief that a particular doctrine, especially a religion or political theory, is superior to all others. The fear of triumphalism has perhaps caused us to forget a little that it is beautiful to be in the Church and that this is not triumphalism but humility, being grateful for the gift of the Lord. Perhaps today we are tempted to say: we do not want to rejoice at having been chosen, for this would be triumphalism. It would be triumphalism to think that God had chosen me because I was so important. This would really be erroneous triumphalism. However, being glad because God wanted me is not triumphalism. Rather, it is gratitude and I think we should re-learn this joy: God wanted me to be born in this way, into a Catholic family, he wanted me to know Jesus from the first. What a gift to be wanted by God so that I could know his face, so that I could know Jesus Christ, the human face of God, the human history of God in this world! Being joyful because he has chosen me to be a Catholic, to be in this Church of his, where subsistit Ecclesia unica; we should rejoice because God has given me this grace, this beauty of knowing the fullness of God’s truth, the joy of his love. On this path we must grow, patiently, and must now learn in a new way what it means to give up triumphalism. The Council had said that triumphalism should be given up - and was thinking of the baroque, of all these great cultures of the Church. People said: Let us begin in a new and modern way. But another triumphalism had developed, that of thought: we now do things, we have found our way, and on this path we will find the new world. Yet, the humility of the Cross, of the Crucified One, excludes this same triumphalism. We must renounce the triumphalism which holds that the great Church of the future is now truly being born. Christ's Church is always humble and in this very way is great and joyful. It seems to me very important that our eyes are now open and can see all that is positive which developed in the period subsequent to the Council: in the renewal of the liturgy, in the Synods, the Roman Synods, the universal Synods, the diocesan synods, the parish structures, in collaboration, in the new responsibility of lay people, in the great intercultural and intercontinental co-responsibility, in a new experience of the Church's catholicity, of the unanimity that grows in humility and yet is the true hope of the world. Thus, I think we have to rediscover the Council's great legacy. It is not a spirit reconstructed from texts but consists of the great Council texts themselves, reinterpreted today with the experiences we have had which have borne fruit in so many movements and so many new religious communities. I went to Brazil knowing that the sects were spreading and that the Catholic Church there seemed somewhat fossilized; but once I arrived there, I saw that a new religious community is born in Brazil almost every day, a new movement is born. Not only are the sects growing, the Church is growing with new situations full of vitality, not in order to complete the statistics - this is a false hope, statistics are not our god - but these situations are growing in souls and create the joy of faith, the presence of the Gospel; consequently, they are also creating a true development of the world and of society. It seems to me, therefore, that we must combine the great humility of the Crucified One, of a Church which is always humble and always opposed by the great economic and military powers, etc., but with this humility we must also learn the true triumphalism of catholicity that develops in all the centuries. Anyone who wished to show this joy would soon be accused of triumphalism. In fact it is not our ability that shows us God's true will. It is an undeserved gift that makes us at the same time humble and glad. If we reflect on the world's perplexity in the face of the great issues of the present and the future, joy should arise again within us at the fact that God has freely shown us his Face, his will, himself. Should this joy manifest itself again in us it would also move the hearts of non-believers. Without this joy we are not convincing. However, where this joy is present even involuntarily it has a missionary power. Indeed, it makes human beings wonder if this might not truly be the way if this joy might not effectively guide us in God's footsteps. This is the humble joy of Israel: to receive a gift from God. This is different from triumphalism, from the pride that comes from ourselves: Israel is not proud of her law like Rome may have been of the Roman Law that it gave to humanity, perhaps like France of the Napoleonic Code, like Prussia of the “Preussisches Landrecht”, etc. — legislation we all recognize. But Israel knows: this law was not made by her, it was not the fruit of her genius, it was a gift. God showed them what the law was. God gave them wisdom. The law is wisdom. Wisdom is the art of being human, the art of being able to live well and of being able to die well. And one can live and die well only when the truth has been received and shows us the way: to be grateful for the gift that we did not invent, but that we were given, and to live in wisdom; to learn, thanks to the gift of God, how to be human in the right way. SO that I can have a view that I understand what the Holy Father is saying, without the feeling that I am persecuted, I will interpret the vague term "Triumphalist"
...As the same sort of people who thought Jesus Christ was going to be some sort of temporal, conquering king. Maybe it is a denunciation of the sort of Catholics who would fight and kill so that they would have a Catholic country with a Catholic society with Catholic values and Catholic governance, for a Catholic future, and eventually, a Catholic world. With charity, I say that to our Holy Father, such Catholics do not believe in the risen Lord to put so much stock in what happens on Earth. But this is the dilemma, how can people talk about "Social Justice" and not be a "triumphalist" Christian who believes in the Glory of God as being limited to the material? Maybe it is better to let people live in abject poverty, because they will be blessed; to let innocent Copts and Syrian Christians be murdered and thus martyred and not overthrow any earthly government for we live in the Risen Lord, yet why bother with the pretense of His Passion? Why shouldn't we just throw out our crucifixes and instead install empty crosses? Perhaps our Holy Father would be delighted when Churches are stripped of sacred art, sacred music, sacred language, and sacred time, and sacred space- because they are associated with -another- more -ancient- form of "triumphalism"? That Our Lord Jesus Christ is in Heaven with all His Saints, the Church Triumphant, that He will come again in all glory worthy of God to judge the living and the dead- That I have hope in His Salvation... I guess that makes me a sort of triumphalist as well. We can't be sure exactly who he's talking about. This is characteristic Judas Council ambiguity. In my opinion I do not think the Holy Father is referring to Traditional or Latin Mass Catholics at all. On the contrary, I think he is speaking of any Catholic who puts ego ahead of authentic Christian spirituality. That is, a Catholic who claims to have the answers but in reality does not misunderstands Christ's teaching. If anything he is speaking of dissenting Catholics who claim to speak for Christ - but in reality don't. A good example of triumphalism is Church Lady, a recurring character on Saturday Night Live once upon a time. She looked down with contempt on anyone who disagreed with her. St. Peter himself said, "Always be ready to give to ANYONE a reason for the hope that lies in you, but do it with gentleness and respect." 1 Peter 3:15. This respect should be both for the message and for the one to whom we give it. Don't forget that we ourselves are merely earthen vessels containing this treasure, as St. Paul put it. A simple reminder that now is the time to be the Church militant. Christ established the Church to extend his salvation to all peoples. The the truth of our Catholic Faith is not about Catholics being right and others being wrong, it is about everyone being invited to truth and salvation in the Church. We condemn heresy because it plunges people into darkness. We have pomp in the liturgy because, if done for God, it gives him external glory. We rejoice in our Catholic Church because we have found a treasure: the True Faith, an extension of the Incarnation and Redemption through time and space, a manifestation of God's unbounded goodness and love to which every one of us poor sinners has been invited. If we make all these things about us being right and others being wrong, we distort their very purpose. Traditional Catholicism has nothing to fear from such reproaches. However, as individuals, we ought to take them as a serious invitation to examine our consciences concerning our purity of intention. I'm not convinced that this polemic against "triumhalists" is what St. Paul was preaching about. Sounds to me like Pope Francis is projecting his own issues onto the reading. I not sure at all what to make of this. I read it, I find the definition of triumphalism and I am not sure who or what he is talking about. It really depends on what Christian's are working in the tradition of man and those working in the traditions of God. Because in the scripture about Jews holding on to traditions but through Christ those traditions are meaningless. So is he saying that the traditions the Church held prior to the new liturgy and new church of Vatican II are like circumcision and the food laws? That would be kind of scary coming from the man setting in the seat of Peter. Or is he refering to the new stuff as being the traditions of man. What he said is very Vatican II in nature in that different people can interprete it differently and all interpretation is correct. It would be nice if someone with authority would clarify what he said but no one in Rome seams really big on that these days. It is as clear as mud. As the shepherd is it not his job to be clear in his teaching to us sheep. I think after the appointment of the disadent has head of the Franciscans of the Immaculate we can come to more clarity as to what he is talking about. His actions clarifies his words and that scares me as one who loves the old traditions of the Church that have made the death, burial and resurrection of our Lord so clear in my heart. So who is the Holy Father to "judge" homosexual leaning priests, but traditionalists are easily judged? I am sad...trying to hang on but not seeing the Love for His flock. It's like picking favorites among children...who does that? Christians who "in their hearts do not believe in the Risen Lord and want to make theirs a more majestic resurrection than that of the real one . These, he said are the “triumphalist” Christians." We believe in transubstanciaton in every TLM. I do not see how the pope can think we do not believe in the risen Lord. We do, with intensity. Many of us drive for hours to get to Latin mass. We are treated a second class catolics. For example, our mass in Ventura Mission was unceremoniously expelled by the new pastor (fr. Tom Elewaut is his name). This was after 15 years of every-Sunday TLM mass. Arch. Gomez found is a chapel to go to, but we were treated as Pelagian Triumphalists and ran out of town by the pastor. Before Pope Francis we attended the Casa Santa Marta 7:00 am mass four or five times. Lots of priests concelebrating, with Guido Marini always there. The chapel is V2, designed by a bad Amercan architect, has the tabernacle on a side wall. But the great advantage was that there was no homily and by 7:30 we were all at breakfast served by the nuns we had communicated with. And then everyone was off to work. But if there was no need to get to work early one can just cross the street and in 2 minutes arrive at the Chapel of the Blessed Sacrament in St. Peter's for an excellent 8:30 am Reverent Novus Ordo that knocks your socks off and ends in Eucharistic adoration. Our Pope would do better skipping the daily off-the-cuff sermon or crossing the street to a real chapel. The short excerpts cause great confusion as they are not well explained. Francis is extremely effective with simple gestures and very few words. People love him and the Wenesday public audiences are more attended than ever, with 70,000 in attendance, and tens of thousands for the Angelus on Sundays. His simple style is very powerful and we should keep out of his way so as not to end up like the Franciscans of the Immaculate. Finally the Vigil for Peace video can be found in Vatican TV YouTube. It was a very reverent ceremony, Tantum ergo and litanies of the saints in Latin, to say nothing of 100,000 faithful praying the Rosary in unison. Pope Francis is excellent at public relations and that will be very good for the church, of which we are, remember, a tiny minority. "It's all too opaque to decipher." wrote Athelshane. Well of course, we should never be against the Pope as Catholics and try love him with filial affection, but I must confess to not understanding most of what our present Holy Father says and does. It's like I'm looking on at him from a distance - observing him - unconnected to him in my heart and uneasy about it all - apprehension about his future speeches and actions is what I esperience if I think too long. So I don't. Better switch the thinking off a bit ....and connect my puzzled and worried heart with the Rosary or some other gift from heaven. Not so good to feel this way about a Holy Roman Pontiff, Vicar of Christ. So sorry about it. You see,Pope Francis would appear to me, to be changing the figure and authority of Peter...moving it in another direction and it is a trial for me to witnesss this as I don't understand why. So a nobody like me disagrees with most of the Roman Catholic hierarchy. Big deal! Who cares? Who is paying attention? Not the Vatican that's for sure. Or someone says who am I to judge inverted Abp Ricca who gave employment and lodgings to his Swiss military lover in the Nunciature from Peter's pence and got pummeled in gay bars and stuck in an elevator with a male prostitute in Montevideo, Pope Francis is very judgemental of the poor Pelagians and Trumphalists even if he or no one else knows what he is talking about. Maybe convents full with nuns and monks are also “triumphalist”. With a possible exception on the second point (I am unsure what depth of heresy the moderns have sunk to), he would have just, devastatingly accurately described himself and all his acolytes. No, it is another attack on Holy Tradition. Brace yourselves for a disastrous Papacy. He who proclaims that belief in the Resurrection trumps our belief in the One, Holy, Catholic, Apostolic, and triumphant Church, will find many friends among protestant heretics. Ultimately this pope will die and be replaced by another. It is best to filter out what is simply the last death throws of the 1970's. "What changes will Pope Francis bring to the Church? “No, he is not desacralising it. He is presenting it in its true evangelical dimension. He is the Successor of Peter and Peter was a simple fisherman." Then I did some research and found that ALL the liberals understand Pope Francis´ actions in Mr. Boff´s way. With every day passing and watching the Pope and hearing what he has to say I´m more than ever convinced that the liberals (or better: the communists?) get Pope Francis right. Fear not dump the paranoia. It is obvious who the Holy Father is speaking about , nuns on the bus, modernists Et Al!!!!! For they truly doubt the risen Lord. Every time this Pope speaks, I get the impression he is addressing a Kindergarten class at snack time. The discourse is shallow, up-beat, silly, essentially meaningless. Next, we're going to be handed a box of crayons and instructed to draw our feelings about "world peace." "Let your yes mean yes, and your no mean no." Perhaps the Holy Father isn't calling any particular group Triumphalist, but is simply saying that triumphalism is a temptation for Christians in stable Churches? He is critising those that use the words triumphalism. He says that they do not understand the meaning of the word triumph. At heart he identifies the source as a disbelief in the bodily ressurrection of Our Lord Jesus Christ. He is absolutly spot on. Think of the nuns who claim they have "gone beyond" Jesus Christ. Think of priests and Bishops who snigger at devotion to our Holy Mother. Think of the confessors who belittle the sacrament of confession by dismissing sin and making it difficult to obtain confession. Think of the distortion of liturgy that takes place so that Father can play central and large in his own cabaret show. This is what comes from this constant "taking the community Mass" mentality with the daily off-the-cuff ferverino. He just can't stop thinking and talking like it's the 70's. And THIS was what at least 77 Cardinals think we need? As many commentators on this post rightly point out, Pope Francis never names clearly the object of his ruminations. He never names a clear object/person/organisation who, or which, is the target of his ruminations/labelling. Argentininian commentators have been saying this over the past 6 months, too, indeed - that it was often hard to discern WHAT or to WHOM he is referring during his term as Archbishop of Buenos Aires. I think it's time Chatham House rules applied to the utterances of Pope Francis: what's said in homilies at Casa Santa Marta, stays at Casa Santa Marta. The gates of hell will not prevail against the Church. Why? Because the Church is triumphant! There was a book titled Triumph and it was written by a Methodist convert(H. Crocker) to the Catholic faith. It covered many of the good things the Church has done over 2,000 years.We have been constantly attacked unfairly over the past 50 years by academia and the media. What is wrong with wanting others to come back to or to join the Church(singular)that Jesus Christ founded? The Holy Father doesn't understand Tradition. He is completely blinded by the prejudices of the 60's and 70's. We must pray for him, more than ever. Let's also pray for the Pope Emeritus Benedict XVI, so that he can give Francis some good and necessary advice on this matters. I'm all in favor of a more "pastoral" pope, with better public relation skills, but he should also be humble enough to understand his limitations. It's very unsettling that, with so many big problems facing the church in all areas, he's so eager to confront the traditional liturgy, who produces so many vocations and conversions, specially among the younger. What's wrong with these "emancipated" people? Why can't they see the action of the Holy Spirit? Not enough faith in the Risen One, perhaps? from an article at a Redemptorist website. I will try to say something about the ways in which redemption and the Redeemer have been understood in the recent enough understanding of the Congregation that carries his name. I think there are several steps. A developing new story (Vatican II): Then came the resurrection. We discovered its place in the mystery of salvation. F.X.Durrwell led the way. He says he had his initial insights into it while still in the seminary in 1937. His definitive breakthrough publication (The Resurrection of Jesus) came out in 1950. His last writing on it is dated 2001 (Christ our Passover). He died in 2005 at the age of 93 and 8 months. Those of us who saw, even partially, what he saw so fully, became a community enlivened by the Resurrection of Jesus. Our ‘new’ constitutions should have been dedicated to the risen one. *We were Easter people. * End of quote. Fr. Durrwell's book, The Resurrection, is beloved of modernists such as ex-nun Joanna Manning. First appearing in French in 1950 and then in English in 1960 it was very influential in post-Vatican II seminaries. Contrast this with what Pope Pius XII says in his encyclical Mediator Dei. The Pope cannot kill the Church, even though he can do a great damage. Summorum Pontificum gave a boost to tradition that can't avoided. And, of course, the FSSPX is still there. Archbishop Lefebvre, pray for us. 24. In the same kind of way as in verse 20, which refers to the poor in the sense of those who love poverty, seeking to please God better, so in this verse the "rich"
from these things and are led by that detachment to use them to help others, as God inspires them. We can find in Sacred Scriptures a number of people to whom the beatitude of the poor can be applied although they possessed considerable wealth--Abraham, Isaac, Moses, David, Job, for example. reckoned righteous.' [...] He was faithful, he did good, received the commandment to offer his son in sacrifice, and he did not refuse to offer what he had received to Him from whom he had received it. He was approved in God's sight and set before us as an example of faith" ("Sermon", 14). heart and soul; it consists in having a humble attitude to God, in being devout, in having total faith. If a Christian has these virtues and also has an abundance of material possessions, he should be detached from his wealth and act charitably towards others and thus be pleasing to God. On the other hand, if someone is not well-off he is not justified in God's sight on that account, if he fails to strive to acquire those virtues in which true poverty consists. Thank you for that. True, it's a serious matter. But honestly, I needed a little levity. I've been confused enough for the last 47 years. Timothy, the shallowness you mention accords with the cartoonish persona he seems intent upon cultivating. He mocked a GIFT of a spiritual bouquet of rosaries. A gift given in love. And not only that, he mocked and made fun of those who gave him the gift to other strangers! He spoke thus publicly in a way that the hurt could get back to those who gave them the spiritual bouquet. I am a convert trying to think of Pope Francis as my holy father. My own agnostic Jewish father and mother would have NEVER done anything so mean-spirited and unkind. I have never ever gotten over this initial event and I would love to hear that it didn't happen. "I can't believe all those Cardinals, inspired by the Holy Spirit, elected Francis. They should have asked me, and in all humility, I would have let them know who should have been pope." Really, with all due respect to you I can think of several people who would have chosen a better Bishop of Rome then was selected and certainly preferable to someone you would have chosen. "Christians are called to proclaim Jesus without…triumphalism"? "..the risk of becoming a Christian without the Resurrection…" ?? "Jesus is the Winner…?" 'the Winner'…???? What is this, a game show? Who TALKS this way? Who SAYS things like this?? A relatively gifted third grader might come up with similar diminishments, I don't know. But, the Pope of Rome..?? Really?.. Do I laugh or cry? I'm seventy years old and cannot imagine a serious person saying such things. I'm mortified just reading about it this morning. I think that the forlorn excuse for a liturgy -you know, the one deviously concocted and installed with conceit- has leveled any possibility of clear thinking in this man. Talk about embarrassing..